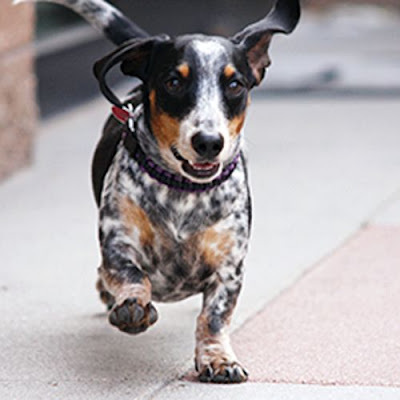 Louie breaks into a run, giving a preview of the speed he will bring to the 18th Street Farmers’ Market Wiener Dog Races on Saturday in Scottsbluff, Nebraska. It will be the second race for the 18-month-old Dachshund, who raced at the Scotts Bluff County Fairgrounds last year. “It’s funny to watch. It’s chaotic, at best. In a way, it’s so bizarre that it’s something to see,” said Chuck Hall, Louie’s owner. Loui definitely is in top condition! I SO like this picture. I've got a blog called "home is where the dachshund is". Unfortunately my dachshund is a knitten one. Therefore no good for racing at all.